Hi all. New to this forum but a long-time (since 1986!) owner of lovely Cream/rosewood Goldstar of 84/85 vintage. Just scored a black/maple 1984 (I hope!) TST40 from Fleabay but someone (probably not the previous owner) has butchered the scratchplate trying to get to the truss-rod screw. 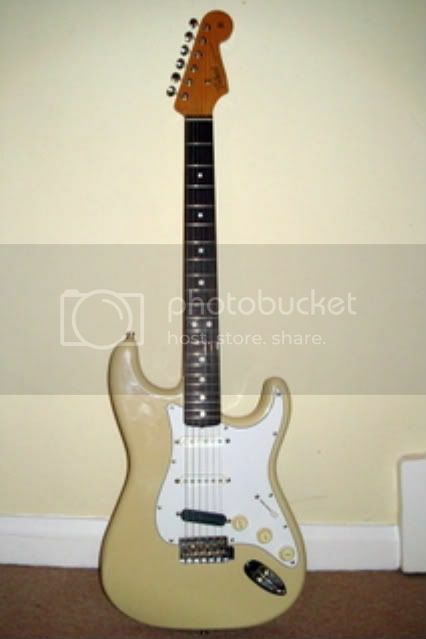 Would love to find an original Tokai white three-ply scratchplate to begin the resto of this guitar. PM or email me if you have anything suitable and we can haggle; I am in the UK and can pay via paypal. Cheers. Not having much luck with this . Lots of US scratchplates about, but the screwhole positions are different and ideally I don't want to make any new holes in the body. This is an american vintage '62 ri strat. A Fender replacement pickguard should fit if you choose the correct model or maybe Allparts, they make really good pickguards. Quite correct about the screw holes, most people don't realise that Tokai RW board models are 64 copies, whilst most Fenders are 62 copies. Nice guitars you have there - what are the pickups on the white one? They look like Seymour Duncan Hot Stacks? It's the red one I'm really interested in though. It looks very like my Fender, with knocks and wear. I'd love to see some more pics of that, if you have any? 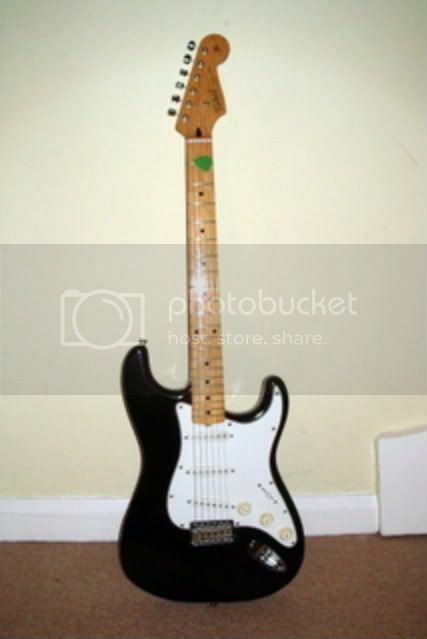 It also has a lot of dings and dents even if it doesn't show in the picture, it's a really nice guitar. Ah, a Master Built relic - they go for silly money! I assumed it was a Goldstar, and I was curious how a poly finished guitar could age quite like that. I'm trying out a Hot Stack in the bridge position on a Strat, & I'm not sure if I like it or not. I've never seen them used in the neck or middle positions though. Clearly they work for you though? Metallic Red is a gorgeous colour. The hot stacks are excellent in the neck/mid positions but a little weak in the bridge position (there are two versions - neck/mid and bridge). I have a bridge hot stack also but replaced it with the little '59. And yes, the metallic red is a great colour! Just had another look at both guitars and it looks like the 40 has the later style of plate (the screw between the middle and neck pickup is nearer to the middle pickup) rather than the '62 reissue' style, so a replacement should be easy to get.